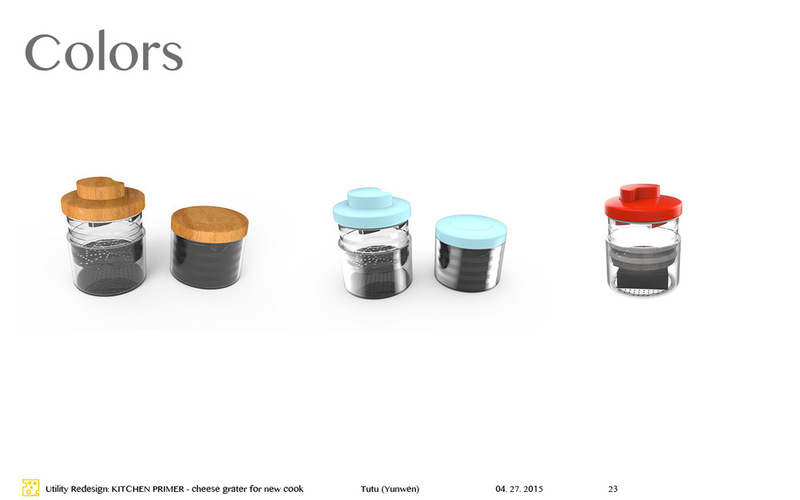 This project was a redesign of an existing product in the market - the ikea cheese grater. I analyzed the pain-points of the IKEA grater and did a research of all kind of cheese graters in the market. This involved analyzing the pain-points of the IKEA grater and a broad market study of all the other competitors. This was educational for me as I had no prior experience using a cheese grater. In order to understand consumer behavior I conducted primary research through interviewing shoppers and vendors at stores. This made me realize that people largely bought cheese graters either when they were new cooks, or had a professional demand for the tool. The market segment I chose to analyze was new cooks. Starting with myself, I began observing the patterns that new cooks formed. I interviewed other people within my market segment about their experience with cheese and graters. Through observation of my colleagues and inference from my primary and secondary research, I identified a few characteristics that were common to this category of user. They generally follow recipes to the last ounce, buy industrially produced cheese blocks and are inexperienced with the storage of perishables. I also did the study of the characteristics of cheese, and chose to design the grater that was aimed at soft block cheeses that new cooks can apply to most of their recipes and easily purchase from supermarkets. Then I started to do 2D and 3D sketches of the grater and different user interactions, with special focus on the way the blades manipulate the cheese. 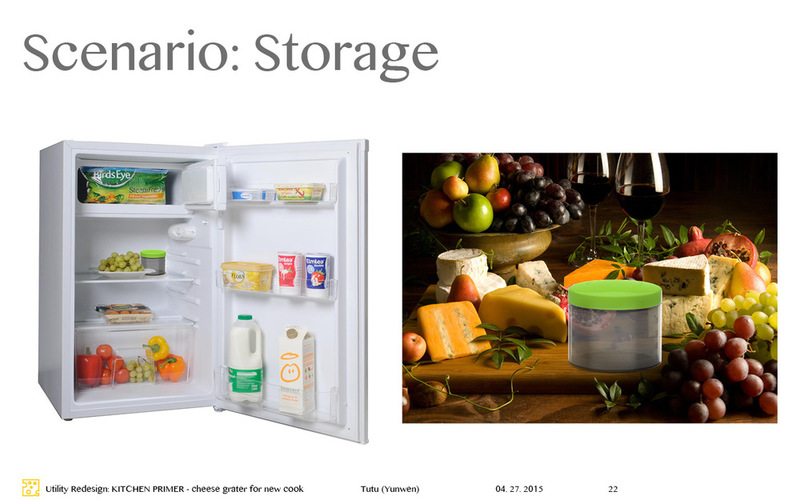 In addition to the obvious function of the grater, I explored the utility value in storage. This led to studies about the space and location of the component parts of the product. Taking these aspects into concern, I also designed for the utility of measurement while grating. Most recipes have set measures of grated cheese required and I was able to categorize them into 8oz at the maximum, and 1oz at the minimum (indicated by level marks on the side of the grater jar). 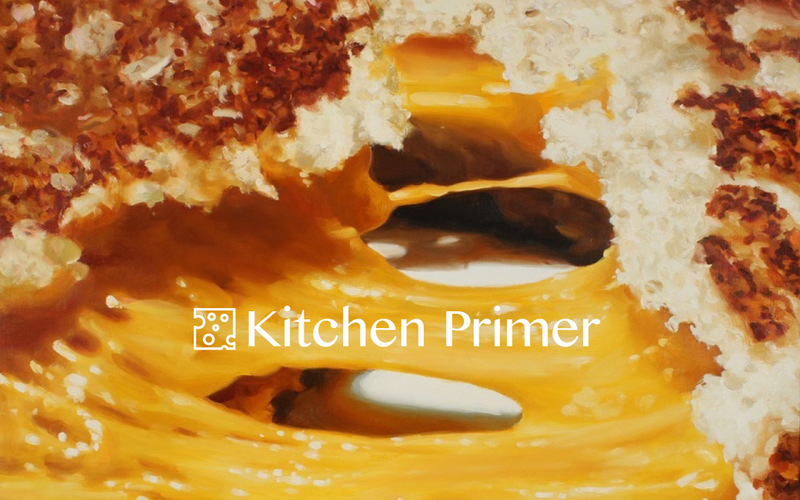 All the above mentioned iterations led to the design of the Kitchen Primer. It is an affordable and efficient grater for beginners, that reduces the steps in the cooking process (through conjunct functions such as measurement and storage).